The gymnasium had its beginnings in a humble hut and is still housed in a small building. MANGALURU: Formidable looking Vinod Raj, the Strong Man of Karnataka, shies away from being photographed and gets on to his routine, powerlifting, in front of the muscled Lord Anjaneya’s portrait at Balanjaneya Gymnasium here. This is the place where powerlifters of Karnataka are forged. It was a proud moment for this gymnasium when the powerlifters arrived from Dubai after clinching 35 medals, including 11 gold, at the Asian Bench Press recently. For, 19 of the 25 members in Karnataka’s contingent were from Dakshina Kannada and 10 of the 19 were from Balanjaneya Gymnasium. 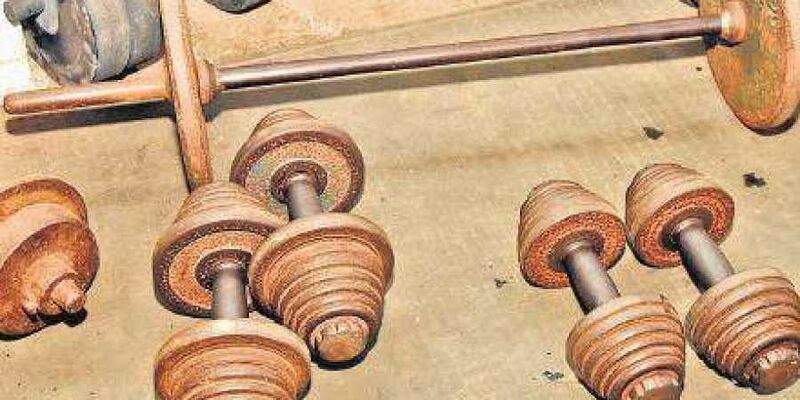 “The remaining nine are also associated with us but they don’t reside in the city,” says powerlifting champion Mohan Raj, the descendant of the founder of the gymnasium. While all the sports associations are based in the state capital Bengaluru, Karnataka Powerlifting Association is based in Mangaluru, the reason perhaps being that most of the powerlifters in the state hail from this coastal city and almost all of them have trained at Balanjaneya Gymnasium. The gymnasium had its beginnings in a humble hut. Today too, it is housed in a small building. Anyone passing by a humble tiled building in a lane off the busy Car Street can mistake it for a residence. But it is actually this famed gymnasium which is turning out powerlifting champions year after year. “It was started by Thimmappa Pandit for his son Babu in 1946 in a small hut to help his son do exercises and lead a healthy life which became popular among the local boys. The most cherishing is the contribution of this gym to the field of powerlifting,” says Surendra Shenoy, treasurer of Karnataka Powerlifting Association. The gym has two sessions. One from 6am to 9.30am and again from 3.30pm to 10pm. What is unique about this gym is discipline. As they are winding up the day’s practice, the powerlifters gently touch the feet of their coach, Satish Kumar Kudroli, before leaving the gym. “They are not expected to touch the feet of the coach but it is the tradition followed from the days of the gym’s inception, showing respect to the master,” Satish Kumar Kudroli says. For all those mighty muscles, what do they eat? It is their usual diet at home and also the abundant fish in Mangalorean cuisine does the magic. “Only during times of competition, we ask them to consume nuts like almonds and pista for more energy”, Kudroli says. For all its achievements, the gym charges just Rs 100 per month and Rs 300 for membership and Rs 3,000 for life membership. “Most of the time, people don’t pay even this small fee. We don’t ask unless we end up in a financial crunch like not having enough funds even to pay the electricity bill,” says powerlifting champion Mohan Raj. Despite winning laurels both in national and international events, the support from state government is not promising, the powerlifters say. “The interest among youngsters in powerlifting is on the rise. The state government should come forward to support budding sportsmen,” says Jayappa Lamani, a powerlifter who had won many medals. The family of Vincent Prakash Carlo has two reasons to cheer. A Commonwealth medal winner and known face of powerlifting here, Carlo brought all laurels to Mangaluru. But this time, his son and daughter too who participated in Asian Bench Press tournament in Dubai, won gold and silver medals. While Carlo’s daughter Venizeia Annie (18) brought home a gold and a silver medal, his son Vance Fallon, studying Standard 10, debuted in this international tournament and clinched a gold medal. 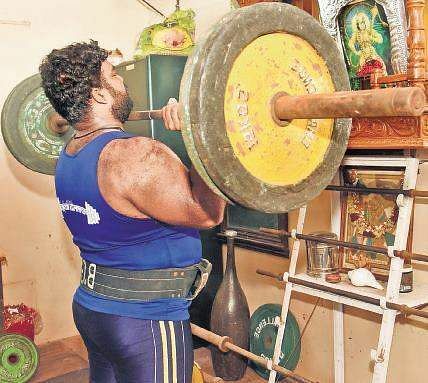 “With the family of powerlifters, it is a record to be included in Limca Book of Records and we would be applying for it, says Carlo’s coach, Satish Kumar Kudroli.